This information was written by Chrizta. 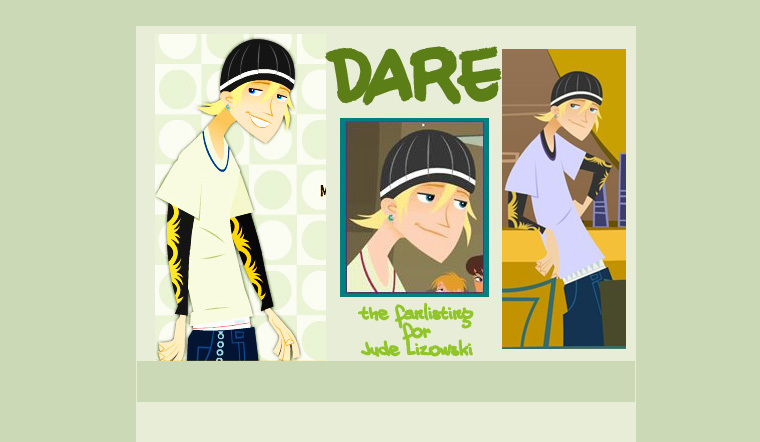 Jude is that "laid-back" type of teen who got fired from a few jobs, due to his laziness and he loves to explore/create new things, plus skateboard. Him and his best friend, Jonesy, are the top two targets in Ron the Rent-a-Cop's list of "maggots" along with the other four. They love to play pranks and just fool around for their own entertainment. He seems to be in his own world most of the time and loves to try anything extreme. Naked sky-diving, anyone? Yes, Jude tried that once and we even find out that he has a peace symbol tattoo on his rear. He is really different from his group of already unique friends, and his ability to state the logical point of view in a situation is really persuasive to others. With a positive and mellow attitude, he always comes up with the perfect solution to his friends' problems. Jude is unpredictable. Due his short attention span, he will get bored easily and we'll find him erupting chaos at the mall. The only things he takes seriously are his friends, infatuations and skateboarding. He's also the confidant friend everyone prefers to share secrets with even though he is not so good keeping them. "That is seriously harshing on my mellow." "Be the dude. Be the dude." Loves: Starr girl and a chair, literally. Cross-Dressing: He's the master of disguises!